Summary: When Rescue hears his trainer say, “You aren’t meant to be a Seeing Eye dog. The service dog team is better for you”, he’s worried. He doesn’t want to let anyone down. When Jessica hears, “You’re an amputee now. You have to wear a prosthetic leg or use a wheelchair for the rest of your life”, she’s worried; her whole family is concerned about her, and she doesn’t want to let them down. Fortunately, Rescue and Jessica find each other, and a whole new world opens for both of them. They learn how to do new things together, and each one thinks the other is amazing. Even when Jessica loses her other leg, Rescue is by her side, helping her get back on her feet again. “You rescued me, Rescue,” says Jessica at the end. The last page: “But the truth was, they had rescued each other.” Includes a note from the authors, a husband-and-wife team who lost their legs (both of Jessica’s and one of Patrick’s) at the Boston Marathon bombing in 2013, that tells about their real-life dog, Rescue. 32 pages; grades K-5. Pros: A powerful story that will captivate kids and maybe inspire them to support the NEADS World Class Service Dog organization described in the author’s note. 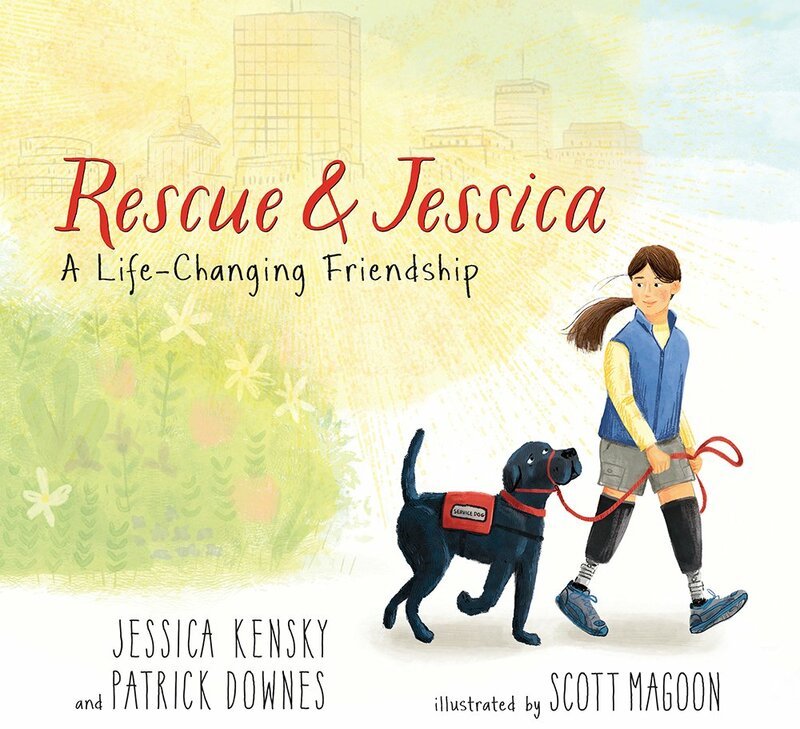 The illustrations are adorable, and the final one of Jessica and Rescue crossing a bridge over the Charles River into Boston is beautiful. Cons: I want to read this to kids, but I can’t even proofread this review without choking up. Your review made me cry. I have to get this one.